What kind of lucky charms are there in your country? 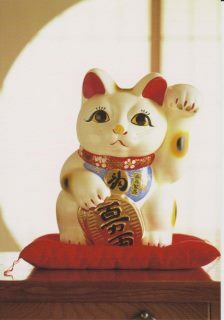 Here, we have many, but one of the most famous ones would be Manekineko or Beckoning Cat, or I think they're also known as "Welcoming Cat" or "Lucky Cat." They're often made of ceramics and believed to bring good luck to the owner or good fortune to his/her business, and you can often find them at the entrace in the shops, restaurants etc. Aren't they cute? I was looking for some lucky charms for my Dutch penpal who just started her own business, so that was perfect! 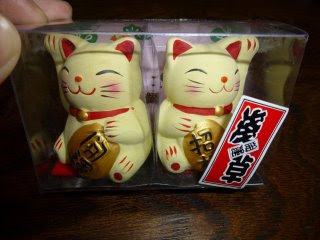 I also found a postcard of Manekineko, and here it is. This guy is not as cute as those two guys I bought (woops, no offense! LOL), but this one is one of the typical look of Manekineko. Thank you! :) I hope they will!